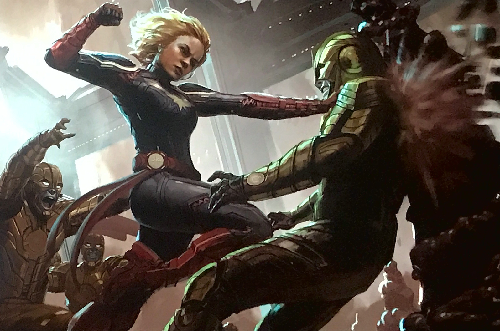 Some new promo art for Marvel’s next two releases after Ant-Man and the Wasp have surfaced, showing plenty of Captain Marvel between her eponymous movie and Avengers 4. Also featured are several Avengers as they will appear in the movie that will close out Phase 3, and with it an entire era of Marvel Cinematic Universe movies. Marvel has a distinct kind of design to their promo art that is pretty consistent from movie to movie. As such, these images seems to line up pretty well, and it’s not hard to imagine that several of the ones made for Captain Marvel can interchangeably be used with the Avengers 4 images. Obviously not the ones for Nick Fury, though. Captain Marvel will be released on March 8, 2019. Avengers 4 will be released on May 3, 2019.